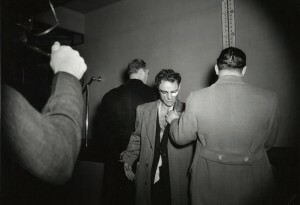 Weegee, Anthony Esposito, Accused "Cop Killer," January 16, 1941. © Weegee/International Center of Photography. For an intense decade between 1935 and 1946, Weegee (1899–1968) was one of the most relentlessly inventive figures in American photography. His graphically dramatic and often lurid photographs of New York crimes and news events set the standard for what has become known as tabloid journalism. The exhibition Weegee: Murder Is My Business draws upon the extensive Weegee Archive at ICP and includes environmental recreations of Weegee’s apartment and exhibitions. At Zip Burger they offer farm-raised, organic, and grass-fed meat and poultry, letting you build your own burger with plenty of gourmet toppings. The first time I went to Subway Inn I thought it was completely strange that there was a dive bar off Lexington Avenue, especially in this neck of the woods, but somehow it works. Born in the 30s, this bar has somehow remained, and thank god, as it’s easily the cheapest place in the area for a drink. For fans of Japanese pop-culture, Kinokuniya Bookstore has a large selection of Japanese themed books, videos, CDs, magazines, comics, and stationary.